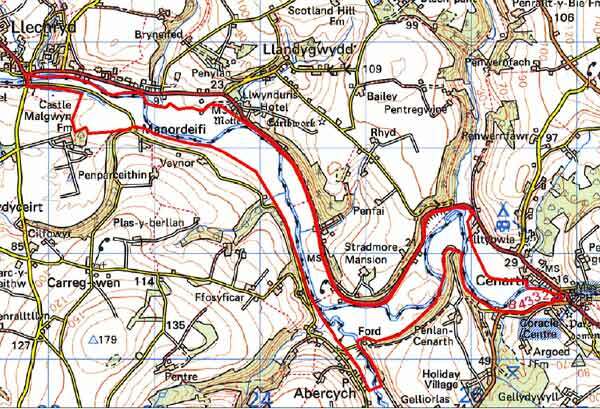 This is a small, narrow area within modern Carmarthenshire, Ceredigion and Pembrokeshire, comprising the rich, scenic floodplain of the lower Afon Teifi between Llechryd to the west and Cenarth to the east, and includes the confluence with the Afon Cych. It is entirely farmland, consisting of fairly large, regular fields of pasture. The Teifi and Cych form the boundaries between the three counties, and the medieval and later history is different in the three counties. Cantref Is Aeron (Iscoed commote) north of the Teifi largely remained in Welsh hands until the 13th century, with a brief period of Anglo-Norman control between 1100 and 1136. The English crown finally annexed it in 1283, when the county of Cardiganshire was created. South of the Teifi, Cantref Emlyn was divided into two commotes by the Afon Cych; Emlyn Uwch-Cych and Emlyn Is-Cych. Emlyn Is-Cych, the the east of the Cych, was brought under Anglo-Norman control in c.1100 when it was reconstituted as the Lordship of Cilgerran. It may not have been fully subdued and it was back under Welsh control by the 1130s, at least, where it remained throughout the 12th and early 13th centuries. It was appropriated by the Anglo-Norman Marshal Earls of Pembroke in 1223, but was granted to Maredudd ap Rhys, with whose family it remained until finally annexed by the English crown in 1283. In 1536, it eventually formed part of the Hundred of Elvet in Carmarthenshire. To the east of the Cych, Is-Cych) remained a marcher lordship (Lordship of Cilgerran) with intermittent periods of Welsh rule, until the late 15th century when it passed to the crown, eventually being incorporated into Pembrokeshire (Cilgerran Hundred) in 1536. This character arewas possibly the scene of an earlier struggle, Llechrhyd being tentatively identified with the ‘Llech-y-crau’ recorded in 1088 as a battle-site and which was clearly a recognised location. The area in general remained subject to Welsh tenurial pattern - with neither vills nor knight’s fees - which has been largely responsible for the dispersed settlement pattern within the region; this and periodical flooding, have militated against settlement within this area. However, a farmstead known as Ddol was oncelocated on the valley floor, but there has been no record of it since the 1840. The present Stradmore Mansion – first recorded in 1610 - was also formerly located on the floodplain, where its walled garden can still be seen, but it was ruined by flooding in the early 19th century and relocated to its present site on an overlooking spur (beyond the character area). The landscape of large, regular fields appears late post-medieval in date and had assumed its present form by the late 18th century when estate maps show it as it is today. However, it would have been more isolated during the historic period, as the road that now flanks the north side of the floodplain -the A484 – did not exist until newly constructed as a turnpike in the late 18th century. Before this, access to the valley floor would have been via farm tracks and lanes. The history of this landscape has thus been overwhelmingly agricultural. However, an industrial element has helped to shape it. Between 1764 and 1770 an extensive iron- and tinplate works was established at Castell Malgwyn, on the banks of the Teifi at Penygored which lies just west of this area. The canal (or leat) that supplied water to the works still runs through this area just south of the river. Materials for the works were brought up the navigable river and there was ample woodland on the valley sides for fuel. The works were successful, passing through several hands until purchased by Sir Benjamin Hammet, who also bought the Castell Malgwyn estate. They ceased to operate in 1806. 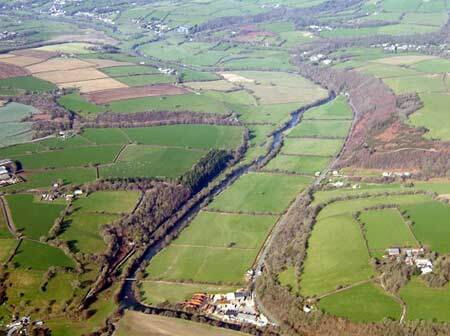 This historic landscape character area consists of 7km of Afon Teifi floodplain between Llechryd and Cenarth. It averages 300m wide and lies at 10m above sea level. Land-use is almost entirely improved pasture with a little arable. Fields are relatively large and bounded by hedges. These are planted on low banks or alongside drainage ditches. Many of them are overgrown, with some reduced to straggling lines of bushes and trees. Apart from an 18th 19th century substantial walled garden and associated buildings on the floodplain (the former site of Stradmore Mansion), and a modern timber yard there are no standing structures in this area. The A484 running along the edge of the floodplain provides a hard boundary to the northern side of this area. The course of a partly infilled canal – more properly a leat – that fed water to a tinplate works downstream, is visible at the western end of this area. Archaeological sites are few and consist of a deserted farm site called Ddol, and a bridge. The Afon Teifi: Llechryd - Cenarth historic landscape character area is well defined on account of its flat nature in contrast to the surrounding rolling farmland.